Instrumentation, measurement, energy harvesting and maker. Abstract – Accurate measurements of partial discharge (PD) activity is essential for the application of this technique to condition-based monitoring. Noise and PD source characterization is necessary to fulfil that goal, since the interpretation of classical phase-resolved partial discharge (PRPD) patterns is usually complex for the measurements done in field. A successful pulse source separation prior to the identification seems to be the best option. The authors proposed in a previous work a method based on spectral power ratios (PR) to separate pulse sources with quite good experimental results. This technique calculates the spectral power in two frequency bands to obtain two parameters which, represented in a 2-dimensional map (PR map), characterize each pulse source by a cluster of points. The main difficulty of this technique is the choice of the appropriate frequency intervals that give a good separation of clusters, which sometimes can be cumbersome by manual means. Thus, this paper presents an unsupervised technique to select the two frequency intervals that gives the best separation among several clusters. This will give a great support for the system user to separate PD and noise sources in real measurements. The authors used genetic algorithms (GAs) to select these frequencies, with good results in several real experiments. Keywords – Partial discharges, genetic algorithms, electrical insulation, power ratio maps, clustering techniques, spectral power, statistical dispersion. Boya, M.V. Rojas-Moreno, M. Ruiz-Llata, G. Robles Location of partial discharges sources by means of Blind Source Separation of UHF signals. IEEE Transactions on Dielectrics and Electrical Insulation Vol. 22, Issue 4, pp. 2302-2310, August 2015. Abstract – Partial discharges (PD) detection is a widely extended technique for the diagnosis of electrical equipment. Ultra-high frequency (UHF) detection techniques appear as the best choice if the goal is to detect PD online and to locate devices with insulation problems in substations and overhead lines. The location of PD is based on the determination of the difference of the time of arrival of electromagnetic pulses radiated by a source of PD to an array of antennas distributed around the monitored area. However, when measuring electromagnetic pulses radiated by PD activity many interfering signals, such as those coming from television (TV), global positioning system (GPS), wireless communication signals and others coming from electrical equipment distort the waveform detected by the sensors. Under these circumstances, the application of traditional techniques to estimate the time differences may fail. In this paper, the use Blind Source Separation (BSS) techniques applied to pairs of UHF sensors is proposed to extract the information of the difference of the time of arrival of the electromagnetic pulses radiated by a source of PD. The paper is focused on the application of the algorithm and the description of an experimental setup for controlled generation and detection of PD to verify the performance of the proposed technique. Keywords – Condition monitoring, impulsive noise, partial discharges, UHF detection, blind source separation, wavelet transform. J.A. Ardila-Rey, J.M. 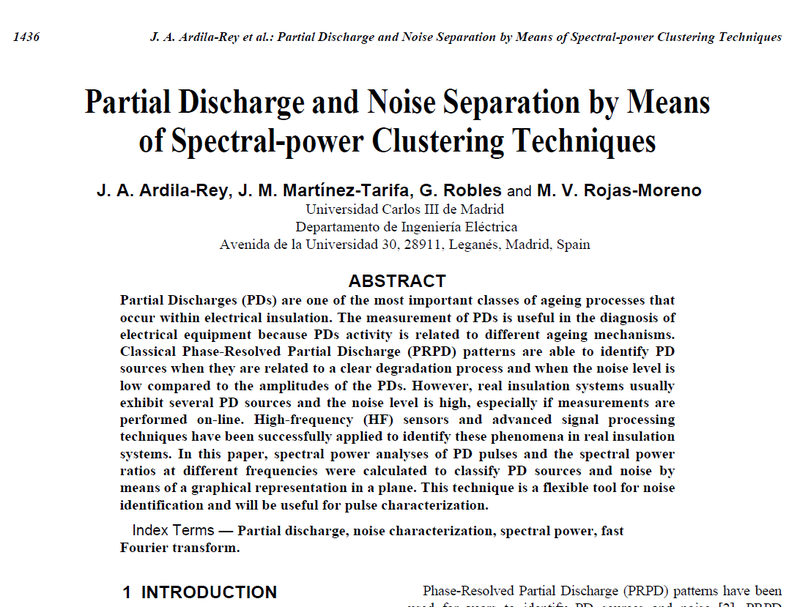 Martínez-Tarifa, G. Robles Automatic selection of frequency bands for the power ratios separation technique in partial discharge measurements: Part II, PD source recognition and applications. IEEE Transactions on Dielectrics and Electrical Insulation Vol. 22, Issue 4, pp. 2284-2291, August 2015. Abstract – Partial discharge (PD) measurement is a widely extended technique for the diagnosis of electrical machines and power cables. Since PD and noise recognition is really important in industrial environments, the authors proposed the use of the spectral Power Ratios (PR) of the detected high-frequency (HF) signals, which show promising results. However, the frequency bands selected for their calculation have a clear influence on the position of the clusters in the classification maps. Following this research trend, a new algorithm for the automatic selection of the frequency bands which gives a proper separation between the clusters, has been proposed in part I of this paper. The first results presented in this paper revealed a good behavior of the technique for PD and noise separation in simple test objects. In this second part of the paper, more results from the application of this system to PD source recognition insimple test objects and also in real equipment are developed. Keywords – partial discharges, electrical insulation, power ratio maps, clustering techniques, spectral power, statistical dispersion. J.M. Martínez-Tarifa, J.A. Ardila-Rey, G. Robles Automatic selection of frequency bands for the power ratios separation technique in partial discharge measurements: Part I, fundamentals and noise rejection in simple test objects. IEEE Transactions on Dielectrics and Electrical Insulation Vol. 22, Issue 4, pp. 2293-2301, August 2015. Abstract – Partial discharge (PD) measurements are important for the monitoring of the status of almost any type of high-voltage equipment. The use of this technique for on-line measurements involves several challenges related to noise rejection and PD source recognition. In order to face these issues, pulse shape analyses are made in high-frequency and very-high-frequency ranges. The authors proposed in a previous paper the so-called Power Ratios (PR) of the spectra as useful parameters for pulse source separation in a two-dimensional approach. This technique provides good results, but its reliability depends on the appropriate selection of two frequency intervals where these spectral power ratios are calculated. In order to improve this separation system, the authors propose an algorithm that provides the frequency intervals necessary to obtain very good separation results in several experimental setups. The explanation of the system and the results obtained are presented in two papers. The simultaneous measurements of pulse sources (PD or noise) are complemented with pulse characterization when only one single source is active in order to check that the selected frequency intervals are appropriate. In this first paper, the authors summarize the fundamentals of the proposed algorithm and its first results for PD and noiseseparation in simple test objects that create corona, internal and surface discharges. Abstract – Partial Discharges (PDs) are one of the most important classes of ageing processes that occur within electrical insulation. The measurement of PDs is useful in the diagnosis of electrical equipment because PDs activity is related to different ageing mechanisms. Classical Phase-Resolved Partial Discharge (PRPD) patterns are able to identify PD sources when they are related to a clear degradation process and when the noise level is low compared to the amplitudes of the PDs. However, real insulation systems usually exhibit several PD sources and the noise level is high, especially if measurements are performed on-line. High-frequency (HF) sensors and advanced signal processing techniques have been successfully applied to identify these phenomena in real insulation systems. 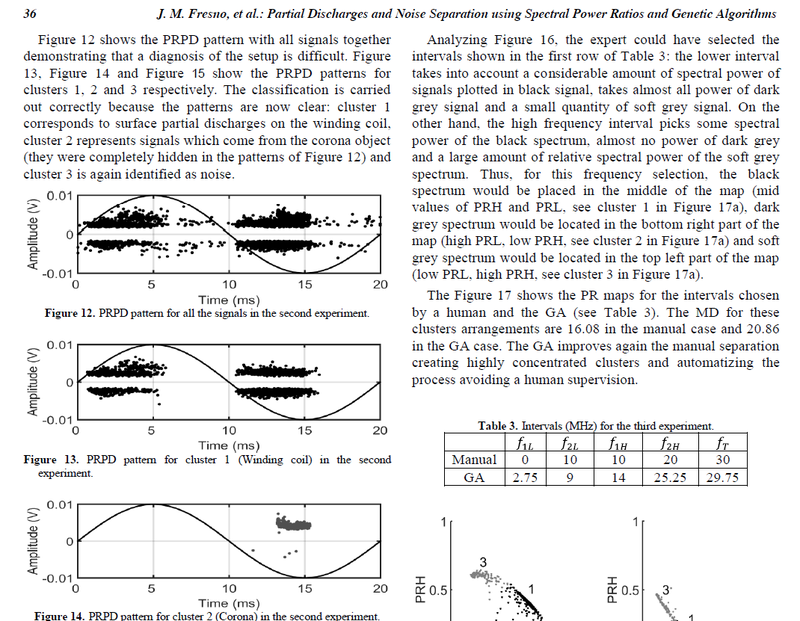 In this paper, spectral power analyses of PD pulses and the spectral power ratios at different frequencies were calculated to classify PD sources and noise by means of a graphical representation in a plane. This technique is a flexible tool for noise identification and will be useful for pulse characterization. Robles, R. Albarracín, J.M. Martinez-Tarifa, Shielding Effect of Power Transformers Tanks in the Ultra-high-frequency Detection of Partial Discharges, IEEE Transactions on Dielectrics and Electrical Insulation, Vol. 20, Issue 2, pp 678-684, April 2013. Abstract – Partial discharges (PD) measurement is a well-known technique for judgment of the condition of power transformer offline. Phase-resolved PD measurement is a normalized technique for PD tests, but noise, especially by PD-measurements onsite is sometimes difficult to reject, and a post-processing of a pattern is necessary to separate different sources. Higher-frequency-detection devices and processing strategies are useful for PD classification and identification. Recently, ultra-high-frequency (UHF) detection by means of antennas has been shown to be a promising detection system for both offline and online PD-measurements. 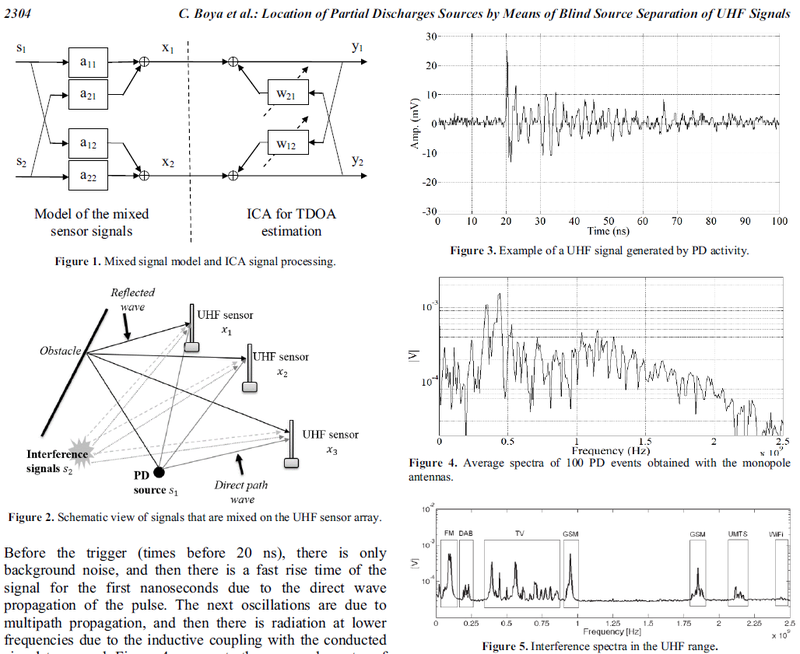 However, it is necessary to assess whether PD source separation and classification is possible by means of pulse analysis because some additional UHF noise sources are coupled to the detected signals, and it is not clear whether different sources produce different pulses. In this study, the attenuation effect of the metallic tank of a power transformer on the inner PD activity when measured outside the tank was studied. 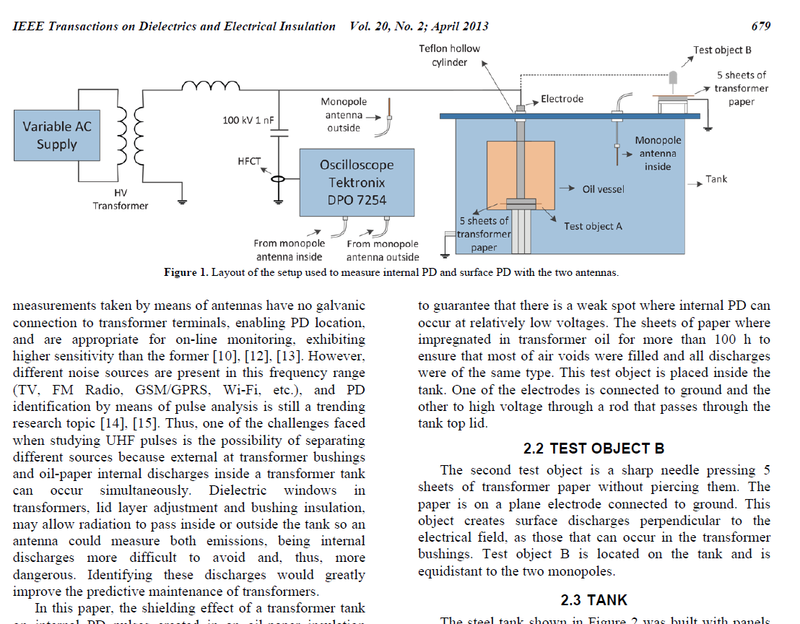 Additionally, experiments were conducted to detect and characterize two different PD sources (internal and external discharges) using two antennas measuring the same phenomenon inside and outside of a transformer. It will also be shown that broadband UHF signals are useful for PD recognition and that a deep study of frequencies below 500 MHz can separate PD occurring inside from those occurring outside when measured with an antenna outside the tank. Keywords –UHF measurements, partial discharges, shielding, antennas. J. Rubio-Serrano, M.V. Rojas, J.E. Posada, J.M. Martinez-Tarifa, G. Robles, J.A. 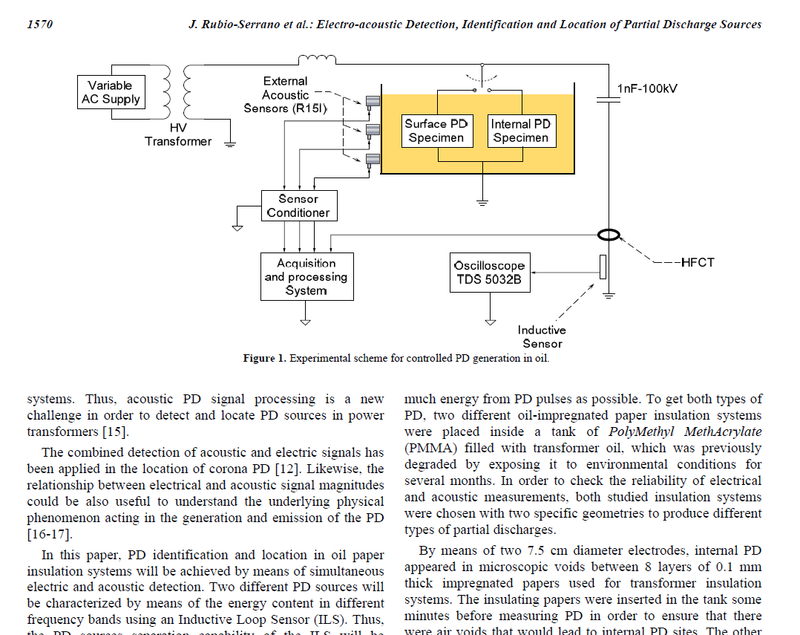 Garcia-Souto Electro-acoustic detection, identification and location of Partial Discharge sources in oil-paper insulation systems, IEEE Transactions on Dielectrics and Electrical Insulation, Vol. 19, Issue 5, pp. 1569-1578, October 2012. 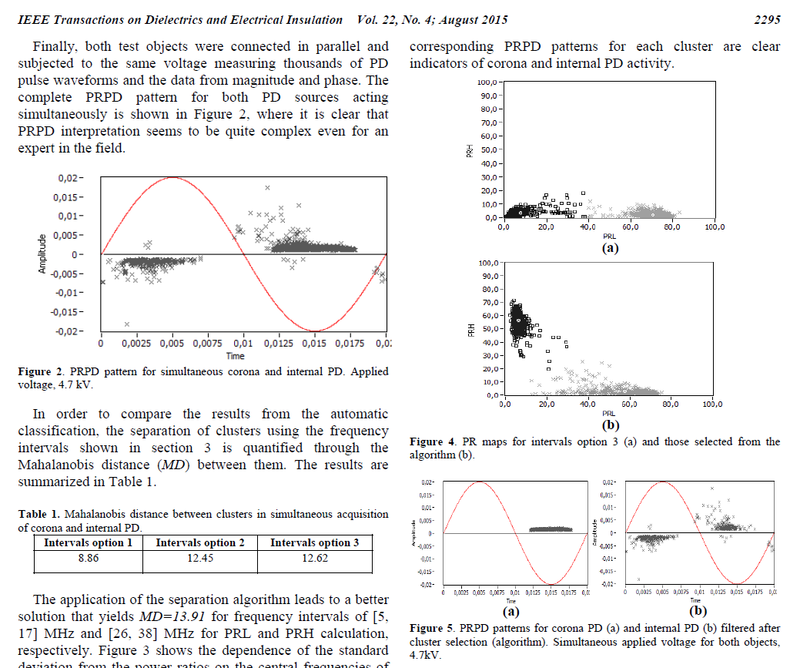 Abstract – The detection of Partial Discharges (PD) is a reliable technique to analyze the status of electrical insulation in power transformers. Phase resolved partial discharge patterns are being complemented with high frequency pulse waveform analysis, in order to identify discharge sources. In addition to this, acoustic techniques are being implemented trying to locate PD sites in large power transformers. In this work, an inductive loop sensor will be used to identify two different PD sources by means of the energy distribution of the detected waveforms. Additionally, these PD sources will be located by means of acoustic measurements with an electrical reference, through the analysis of the acoustic activity detected for each sensor individually. J.M. Martínez, J. Rivas, G. Robles, J. Sanz. 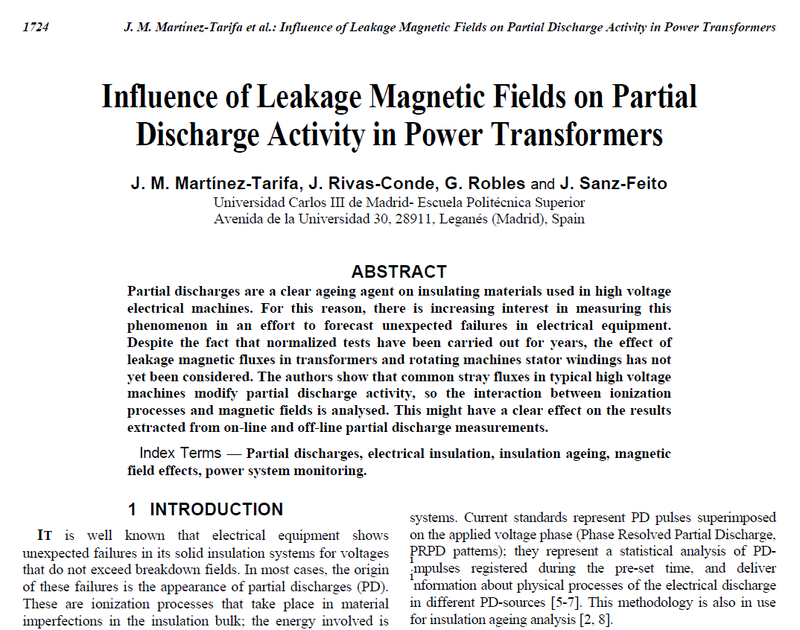 Influence of leakage magnetic fields on partial discharge activity in power transformers. 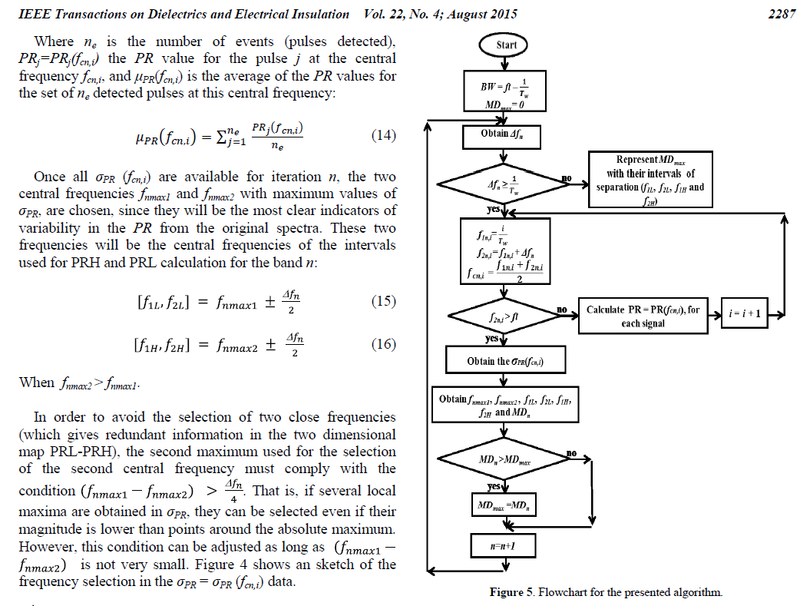 IEEE Transactions on Dielectrics and Electrical Insulation, Vol. 17, Issue 6. pp. 1724-1730, Dec. 2010. Abstract – Partial discharges are a clear ageing agent on insulating materials used in high voltage electrical machines. For this reason, there is increasing interest in measuring this phenomenon in an effort to forecast unexpected failures in electrical equipment. Despite the fact that normalized tests have been carried out for years, the effect of leakage magnetic fluxes in transformers and rotating machines stator windings has not yet been considered. The authors show that common stray fluxes in typical high voltage machines modify partial discharge activity, so the interaction between ionization processes and magnetic fields is analysed. This might have a clear effect on the results extracted from on-line and off-line partial discharge measurements. Keywords – Partial discharges, electrical insulation, insulation ageing, magnetic field effects, power system monitoring. Except otherwise noted, content in this site is licensed under a Creative Commons Attribution-ShareAlike 4.0 International License. NUCLEO-L031K6 and ST-LINK SWD. What on earth did I do?